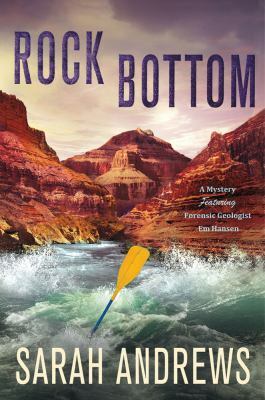 Rock Bottom is the latest book in the Em Hansen, geologist, mystery series that begins with Tensleep. The series is mainly set in the American West, except for visits to Florida and Antarctica, where the author spent two months. Rock Bottom is set in the Grand Canyon where Em, her new husband Fritz, and his teen son Brendan are white water rafting. Em is scared to go rafting but keeps quiet as Fritz was thrilled when his friend Tiny got a permit for a private three week rafting trip. Unfortunately Tiny is recovering from a motorcycle accident and sends geology graduate student/river rat Wink Oberley instead. A nearby church group and 13-year-old Brendan’s absent mother are creationists, believing that the world is about 6,000 years old. Brendan has questions as they raft down that river that Em, a forensic geologist, tries her best to answer honestly. The scenery, geology, rafting, and camping along the river are vividly described. The reader learns early on from a park ranger’s notes that Wink Oberley is missing, presumed drowned. A womanizer and a troublemaker, many people disliked him. In this mystery, there is little violence, and the story is more about the river journey than about Wink’s death.